Keep Food Clean & Safe! 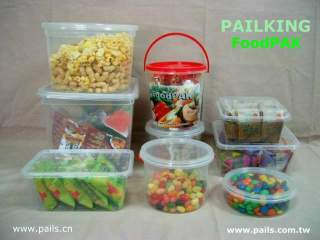 The Perfect plastic containers for all your food storage needs! Colorful, 1-6 gallons, tapered- sided, heavy duty, constructed of Polypropylene (PP) or High Density Polyethylene (HDPE) resin, with ribbed reinforcements for strength & an O-ring that seals airtight. Complying with UN standards, strong, rust-free, seamless & impact-resistant. Can be stacked for easy storage, saving warehousing & transportation costs. High-quality printing on the pails for effective long-term advertising. Easy-Tear strip ensures easy opening; when used for liquids, the pull-up spout adds to your protection. Recyclable; consumers can use the pails for other purposes. * Clarity and Visibility: Allows for easy identification of contents *Economical and Environmental friendly: Reusable, recyclable and less expensive Convenient: Microwavable up to 120 ; fridge safe down to -10; and dishwasher safe. Please inquire if you are looking for particular capacities and specifications. All pails, except 1L or less , come with standard sturdy plastic handles. Wire handle is available upon request. Available in a full range of colors. White, Red, Green, Yellow, and Blue. Standard covers all come with easy tear-strip. Easy to open, fully reusable, and close airtight for protection.